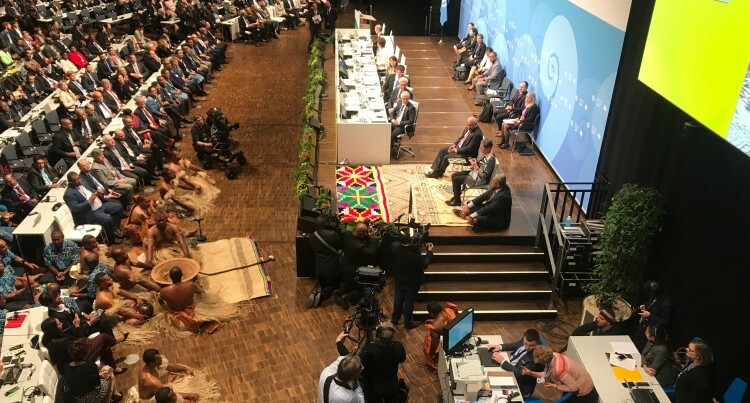 Morocco last night passed the baton to Fiji as Prime Minister Voreqe Bainimarama assumed the Presidency of COP23 in Bonn. Outgoing COP22 President Salaheddine Mezouar said: “I welcome the Fijian President in this key element of addressing climate change. If we want progress we have to work with states and non-states. Action and progress are our shared priorities and we must all work together in solidarity and I often come back to that word because it is at the heart of our challenges. “Today Morocco takes back its place as a party, as a country – but we will continue making resolute actions for climate change. We will continue to apply our principles at all levels of Government,” he said. Mr Mezouar is the Minister of Foreign Affairs and Cooperation of Morocco. COP23 President Voreqe Bainimarama while accepting the role said it was an honour for Fiji to receive the baton from Morocco of the presidency of COP and assume the responsibility for implementing the Paris Agreement and prepare the way for more ambitious climate action. “For one of the most vulnerable parts I have a collective plea to the world to maintain the course set in Paris. This is our moment of truth when all of us in this room will be tested. “We are all in the same canoe, which is why we have the drua – a Fijian ocean-going canoe in the foyer. To remind us of our duty to fill its sail with a collective deter-mination to achieve our mission. To show its support, the host venue, Germany has pledged an additional 50million euros towards the climate fund.